John Hardy necklace from the Modern Chain Collection. 18-karat yellow gold box chain, 1.4mm. Integrated square pendant with pavé diamonds. Armenta necklace from the Old World Collection. 18-karat yellow gold and blacked sterling silver. Pointed bezel-set cushion Aquaprase??? pendant. White G-H diamond pav?? halo. 0.20 total diamond carat weight. Approx. 18"L; 0.6"L drop. Adjustable; toggle clasp. Made in USA. Armenta star pendant necklace from the Old World Collection. 18-karat yellow gold and blackened sterling silver hardware. Round disc pendant with champagne diamond crivelli star. Baguette-cut white sapphire accents. 0.18 total diamond carat weight. Approx. 16-18"L; 0.7"L drop. Adjustable; toggle clasp. Made in USA. Senso?? 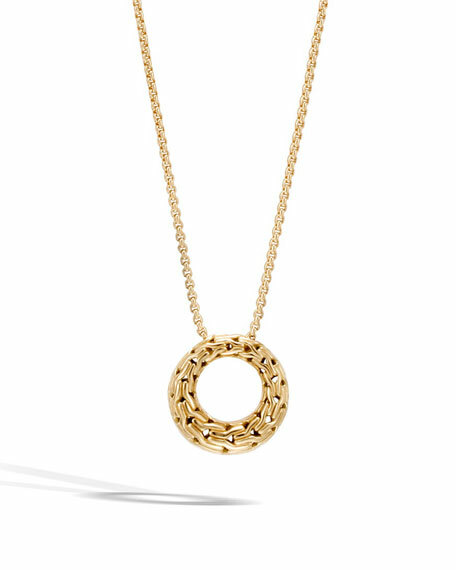 Collection pendant necklace by Ippolita. Handcrafted in 18-karat yellow gold. Round wavy disc pedant with white diamonds at center.